A blood glucose monitor is an essential tool for managing diabetes. Blood glucose or blood glucose level is the quantity of sugar in a person’s blood. Blood glucose is naturally controlled by the body as part of the metabolic homeostasis. It is also considered as the main source of energy for the cells of our body as well as for blood lipids. The bloodstream is the main transporting conduit for glucose from the intestines or liver, where it is absorbed, and to the body cells. The cells absorb blood glucose through the hormone insulin produced by the pancreas. The level of blood glucose in your body is lowest in the morning and increases only after taking your first meal. An increase in the level of blood glucose in your body more than the normal level is a sign of a medication condition. A high level of blood glucose is called hyperglycemia, while persons with low levels of blood glucose have hypoglycemia. A person with persistent hyperglycemia may be suffering from diabetes mellitus, which is considered as the most common disease borne out of the failure in blood sugar control. The sudden increase in blood sugar levels may also be caused by intake of alcohol but can immediately fall later. Some drugs can also increase or reduce blood glucose levels. 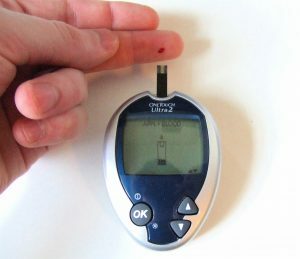 A blood glucose test is used in measuring the amount of glucose in the blood. It is important to test blood glucose levels since high blood glucose levels can damage the blood vessels, nerves, eyes and kidneys. Blood glucose tests are important to determine if the patient has prediabetes or diabetes or has a an abnormally low blood sugar level. One example of blood glucose test is the Fasting Blood Sugar (FBS), which measures amount of blood glucose after fasting for 8 hours. A random blood sugar can measure blood glucose regardless on what time you last ate. An oral glucose tolerance test (OGTT) requires a series of blood glucose measurements to determine if an individual has diabetes, while a two-hour postprandial blood sugar measures blood glucose exactly two hours after the start of meal intake. The blood sugar level or the serum glucose level is the amount of glucose in the blood and is measured in millimoles per liter. A person without diabetes may have a blood sugar level of 4 to 8 mmol per liter. Blood glucose levels need to be controlled to lower the risk of developing diabetes and its complications.